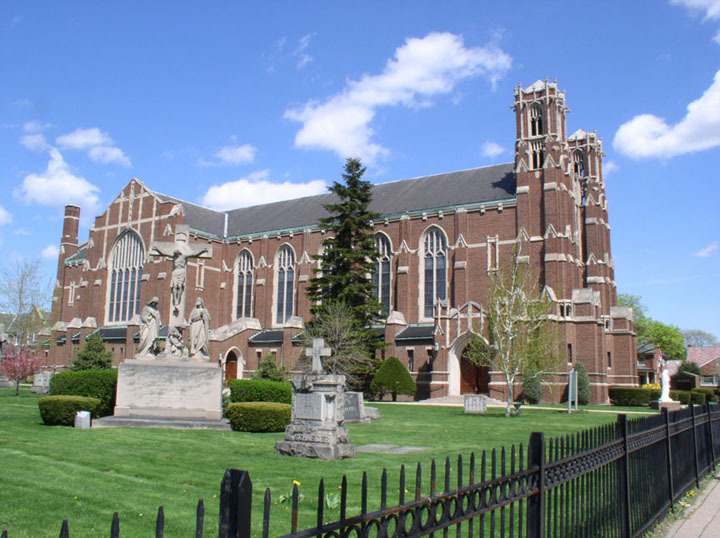 St. Alphonsus parish had its beginnings when some 40 German families from Rhineland-Westphalia settled in the area that is now east Dearborn between 1825 and 1845. In 1846 Peter Esper donated some of his farm land to establish a Catholic school. The first mass was celebrated in 1851 in the Esper home. In 1852 the Redemptorist Fathers organized St. Alphonsus Parish, named for the founder of the priest's order. A small brick church was built on the property donated by the Esper family at Warren and Schaefer and was in use until a new church was built in 1874. No photos exist of the original church. Ground was broken on April 11, 1928 for a new church building for St. Alphonsus parish, to replace the 1874 building. Architect Arthur des Rosiers designed the church, as well as the 1925 convent, in the Neo-Gothic style. The church is built in the form of a cross, the ceiling arches are crowned with Tudor-style wooden beams, and the floor is laid with Pewabic tiles. Paintings by Alfred Wrobbel can be found throughout the church, and the 38 foot high altar features Roman stone and Italian marble. The first mass was celebrated in the new church on Easter Sunday, March 31, 1929. All services were then conducted in the new church, although the altars were not completed until February 1930. The formal dedication of the church building occurred on May 18, 1930. When the new church opened none of the stained glass windows were in place. Photos in the book from the dedication show what appears to be a plain ripple patterned glass in the windows and credits the Wayne Glass Co. for the glazing. The first group of stained glass windows was installed in 1931. These windows were made in Austria by the Tyrolese Art Glass Company and included the large window in the choir, one of the transept windows, the four sanctuary windows and one nave window. The smaller memorial windows in the side aisles were installed during the 1930's and 40's. Most of these windows are inscribed "Made in Austria" or "Tyrolese Art Glass Co, Innsbruck Austria". The remaining nine nave windows and one transept window were installed sometime after 1945 and were made by the Detroit Stained Glass Works. The parish history book published in 1952 for the 100th anniversary incorrectly credits all of the stained glass windows to DSGW. The windows from DSGW can be identified by a simplified decorative panel above and below the main image where the Tyrolese windows have a very intricate pattern. The Ascension of the Lord into Heaven.